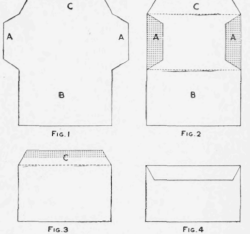 Any size of envelope for mailing special papers or documents can be made as follows: All envelopes are of the same shape as shown in Fig. 1; the size for the papers to be inclosed is represented by the dotted lines in Fig. 2. The projections A are coated with paste, and the flap B is folded over them. The envelope is then ready for the inclosure. The flap C is pasted and folded over as with an ordinary envelope. - Contributed by L. E. Turner, New York City.